We welcome you to consider becoming a participant in one of our research studies related to vasculitis. Many studies involve little more than donating a blood sample during one of your appointments. Often grateful patients, family members, and friends ask what they can do to support the work of the Johns Hopkins Vasculitis Center. Financial support for medical research directly benefits our patients. For this reason, we have established the Discovery Fund for Vasculitis Research. 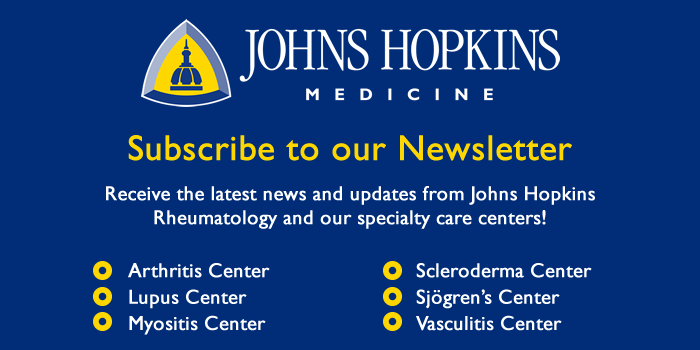 Although grants support some of our research and patient education projects, monetary gifts from individuals who realize the importance of these efforts play an essential role in maintaining the Johns Hopkins Vasculitis Center as a Center of Excellence. Checks should be made payable to Johns Hopkins University.